In my interview with Nacho Vigalondo, a writer and filmmaker, he said that he is a big fan of a monster movies but in reality he was just a low budget filmmaker. 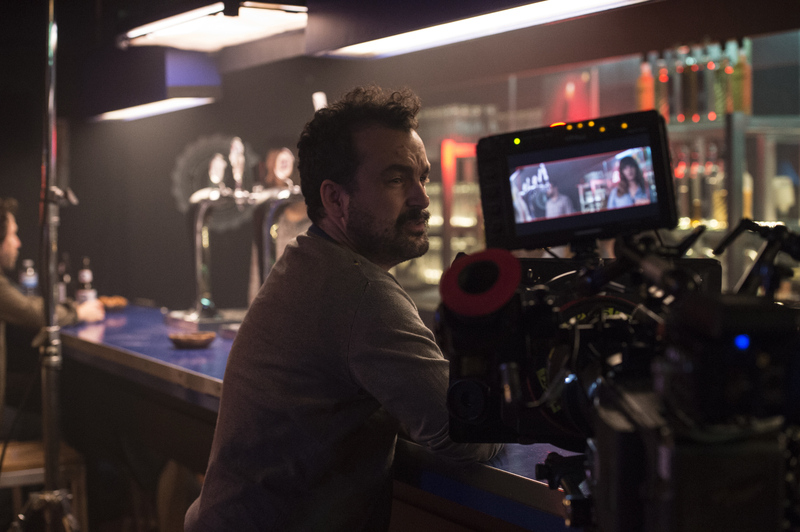 But honestly, after watching Colossal, you would really wish every filmmaker would have had the same attitude that Nacho Vigalondo has. Having said that, Colossal is a movie about a monster, about a woman who is directly responsible for its appearance in Tokyo, and a man, who more or less, knows how to turn things for the worse. Colossal is not just a monster movie. It’s funny, entertaining, and an absolute delight to watch. For Colossal, Nacho Vigalondo was able to cast Academy Award winner Anne Hathaway and John Sudeikis. But its original screenplay is something I am sure you have not seen before, is what stands out more. Yes, performance wise it’s brilliant. But the writing and directing, I guess, is what makes Colossal one of the biggest films of the year. As part of promoting the film in Toronto where it opens this Friday, I got a chance to interview the writer/director Nacho Vigalondo who gladly agreed to share his experience writing and making a movie about his most favorite creatures – monsters. MOVIEMOVESME: You have a great combination of every element you could use in “Colossal” to guarantee the viewer’s full satisfaction. Where did the analysis or planning come from? Nacho Vigalondo: Sometimes when you write a movie, you need to be settled with what you’re doing. I need to tell the story in this term. I need the story to be funny, dark and even silly. Because it comes something from your view level of storytelling. I am really satisfied how the movie has been received or how it has been the part of discussion. MOVIEMOVESME: But where the idea of writing the story come from? Nacho Vigalondo: Because I love monsters, therefore, I wanted to make one of my own. And the way I started writing the scenes, as back in a days, like four or five years ago. It is just how you can see the scenes from a different perspective. Instead of having monsters, we were going to see how people living far from the disaster experiencing the whole thing through the media. I did not wanted to be the smartest guy in the room. I just wanted to find a way to make a casual film with a low budget. Because, I am trying to be realistic, I am low budget filmmaker. When I wrote “Colossal” I wanted to find a formula that would let me to make a small monster movie, which seems paradoxical. Because monster movies need to be big. My humble will was to make a small movie. The scenes and characters came later. Once I found Gloria, then I found Oscar. Then I found a reason to fight, the movie became something different and much more interesting. And I have to say that in the beginning it was much more scary. MOVIEMOVESME: I wonder what was your initial casting choice? Did you know that Anne Hathaway will end up having a lead role in your movie? Nacho Vigalongo: Oh, no, no. One of the biggest turning point in my whole career was when I knew that Anne Hathaway will be in my movie. It was not a long casting process. She approached us. During that time we did not even have a budget. We needed to find some funding. When she approached us, I could feel like everything was changing around me. I knew that this is going to happen. Let’s pretend that this movie will get an Oscar for a best movie. If I get that award, the turning point will be smaller for me, but the biggest turn would be that I did not even anticipated it from this movie. It’s impossible that nothing happened to me related to this film bigger than that. MOVIEMOVESME: There was a big fight scene between Gloria and Oscar. Only that scene was enough to watch. Would you talk about idea behind that part of the story? Nacho VIgalondo: This movie is about violence. It’s about people fighting. But you need to have a reason for them to have that fight. Once we realized that the main character must be female and that she needs to fight with a man, suddenly the stick of the story grew. And I was completely aware of that, in this movie I am touching a very specific topic. Once I knew that this woman and this man have to have a fight, I need to shoot those scenes in a very respected way. Having said that, I could not portray Oscar as a typical villain that you could see from the beginning. That would have been unfair. I mean, in a real life, it’s not just an evil guy that came out from a different planet or out of space who is in abusive relationship. He is a nice guy that becomes something different as a time passes. So it would not make sense if Oscar had been the same guy in the beginning. I had to show the dynamic of abuse in much more delicate way. MOVIEMOVESME: I wonder how many times you need to watch the movie before making a final decision? Nacho Vigalondo: Oh no, it does not work that way. You’re making a movie again and again. And suddenly comes a moment when you are not allowed to change anything. Here is like, “OK, I am sorry but we have to send the movie to Toronto International Film Festival tomorrow, so we cannot change anything else”. That’s the way it works. If you give me one more year to work on the movie, it would be enough to improve it. Otherwise, in reality, you never finish a film. MOVIEMOVESME: What is your favorite scene in terms of filming it and seeing it as an end result? Nacho Vigalondo: The scene that I enjoyed making was, probably, one of the craziest one, was the fireworks scene. I loved writing it, filming and editing. I think it was the best scene in entire film. That sequence for me was a chance to elevate the situation. The story itself without it could have been much boring. I just needed to portray the madness inside Oscar in a real, and the same time, in a silly way.